GB Connections (GBC) began providing innovative connection solutions in 1980 and in the summer of 2017, broke off from its tubular division to concentrate solely on growing and expanding its connection division. Now with its fourth generation semi-premium casing connection, GBC continues to deliver on its mission to provide new design solutions to meet the ever-evolving needs of oil and gas companies. GBC reaches a milestone of over 2,000,000 installed feet of 5-1/2" casing for Rotating and Drilling with Casing Applications. With the inception of drilling with casing in the early 2000’s, GBC is awarded US Patent for Coupling for Drilling-With-Casing Operations to meet industry needs. GBC awarded US Patent for a Threaded Pipe Connection Having A Retainer Gasket with Pressure Relief Vents. GBC awarded US Patent for a Threaded Coupling with a Water Exclusion Seal. 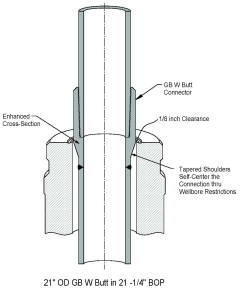 GBC designs the first connection that truly multi-tasks with its Drilling Riser Connection on 13-5/8" OD, 88.20 ppf, P-110 Casing for Shell URSA Project. GBC designs specialty connection for vacuum insulated tubing using 5-1/2" OD, 23.00 ppf 13Cr80 called Tahoe TCC. Shell Tahoe Project. GBC designs Drilling Riser Connection on 10-3/4" OD, 51.00 ppf, P-110 Casing for Shell Ram Powell Project. 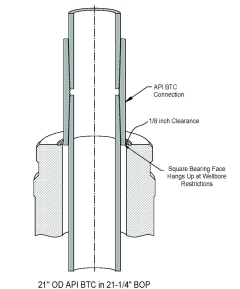 GBC designs two, 100% joint efficient, special clearance coupled connections on heavy wall 7-5/8" and 10" OD Casing for Shell's Popeye Project. GBC is awarded a US patent for GB Twin-Cantilever Coupling. GBC begins providing innovative connection solutions with the first semi-premium connection on the market: A large OD weld-on buttress connection predominantly for offshore applications.